On a hot summer day in Oakland, California, a group of teenagers are painting the wall of a school building. Another dozen are picking up trash at a nearby park. A separate team is preparing crafts for small children. None of them are getting paid. They aren’t working off community service hours for a parking ticket nor fulfilling a required school project. It’s a mission trip, and these teenagers have paid to serve as part of Maranatha Volunteer International’s teens-only project called the Ultimate Workout. Typically, this project takes place overseas, but when families began requesting service opportunities in the United States, Maranatha created Ultimate Workout-USA. The North American version of the project debuted last year at Milo Adventist Academy in Oregon. This year, Maranatha partnered with the Seventh-day Adventist Church in Northern California to hold the Ultimate Workout in Oakland. The collaboration was part of the Bridges Initiative, a Northern California and Central California Church plan to reach the city of Oakland through community service programs, evangelistic meetings, and church plants. The Ultimate Workout volunteers assisted with the community service aspect of the initiative. 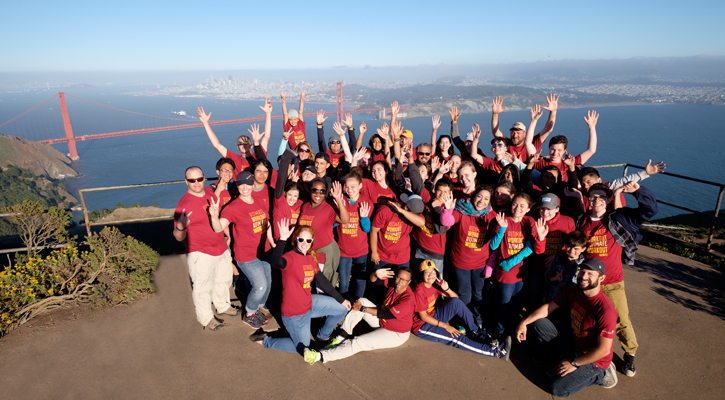 During the ten-day project, the volunteers helped with free dental, medical, and eye clinics for the community; led out in Vacation Bible School; participated in a cleanup effort at a local park; painted the exterior of Immanuel Temple Adventist Church; and assisted with renovations at Golden Gate Academy. Volunteers came from all over California and the rest of the United States, including Colorado, Michigan, and New Mexico. Seventeen-year old Meaghan Gano came to the Ultimate Workout after hearing about the mission trip on Maranatha Mission Stories, Maranatha’s weekly television show. During a time when most teenagers would rather be enjoying their summer break with friends and relaxation, Gano spent her days camping on the baseball field at Golden Gate Academy and waking at 6 a.m. to face a full day of painting in the sun. But Gano wouldn’t have it any other way. Even those from California had a true mission experience on Ultimate Workout. Anzarath Chavez-Duron, age 15, traveled the shortest distance—she is a member of the Oakland Spanish Adventist Church and lives just ten minutes away from base camp at Golden Gate Academy. Chavez-Duron was one of the most enthusiastic participants in the group, particularly because the mission was serving her hometown. At the end of the project, the young volunteers had racked up an impressive list of accomplishments. But beyond the long list of completed tasks, the teens achieved a more important goal: a closer walk with God. Each day on Ultimate Workout began and ended with worship. Twice a day, volunteers gathered to sing, pray, and study the Bible. For 14-year old Micah Kontes, the experience was transformative. Kontes says that the Ultimate Workout was his parents’ idea; participation wasn’t offered as a choice. He wasn’t happy about being forced on a mission trip, but just a few days in, he says he felt the Lord working on his heart.